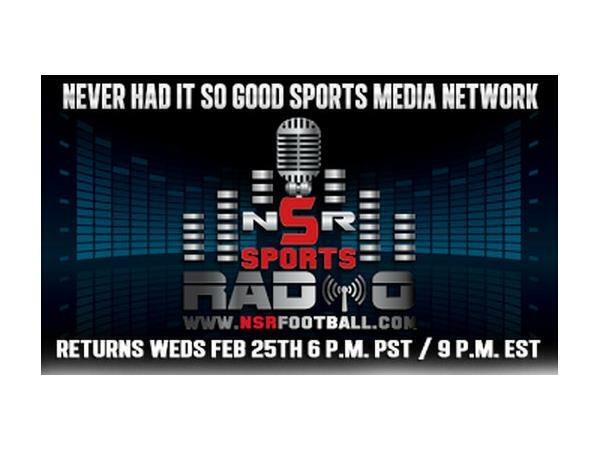 NSR Sports Radio returns This Weds Feb 25th at 6 p.m. PST/ 9p.m. EST and is proud to also announce the we are now a part of the NHISG Sports Media Network. Join Your Host Coach P as we discuss the trending topics in youth, college and Pro football as well as Platinum Star award updates, Top 15 info, youth All Americans and more!! We also welcome the return of "Ask the Duck" Coach David Riley, director of the Glazier clinic and Unsigned Senior Showcase has over 25 years ofknowledge and is waiting share it you. New to our Cast is Former Oregon Duck star and Top NFL Draft Pick, Akili Smith who's "Real Talk with Akili" segment will provide a no holds bared look at the game, as well as provide information that coaches of all levels can benefit from.